Early Christian physicians and martyrs whose feast is celebrated on 27 September. They were twins, born in Arabia, and practised the art of healing in the seaport Ægea, now Ayash (Ajass), on the Gulf of Iskanderun in Cilicia, Asia Minor, and attained a great reputation. They accepted no pay for their services and were, therefore, called anargyroi, “the silverless”. In this way they brought many to the Catholic Faith. When the Diocletian persecution began, the Prefect Lysias had Cosmas and Damian arrested, and ordered them to recant. They remained constant under torture, in a miraculous manner suffered no injury from water, fire, air, nor on the cross, and were finally beheaded with the sword. Their three brothers, Anthimus, Leontius, and Euprepius died as martyrs with them. The execution took place 27 September, probably in the year 287. At a later date a number of fables grew up about them, connected in part with their relics. The remains of the martyrs were buried in the city of Cyrus in Syria; the Emperor Justinian I (527-565) sumptuously restored the city in their honour. Having been cured of a dangerous illness by the intercession of Cosmas and Damian, Justinian, in gratitude for their aid, rebuilt and adorned their church at Constantinople, and it became a celebrated place of pilgrimage. At Rome Pope Felix IV (526-530) erected a church in their honour, the mosaics of which are still among the most valuable art remains of the city. 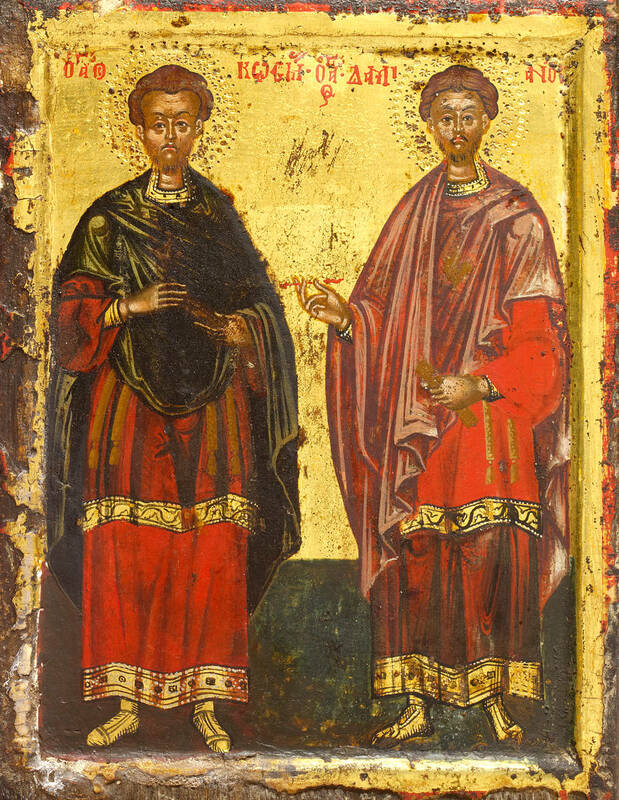 The Greek Church celebrates the feast of Saints Cosmas and Damian on 1 July, 17 October, and 1 November, and venerates three pairs of saints of the same name and profession. Cosmas and Damian are regarded as the patrons of physicians and surgeons and are sometimes represented with medical emblems. They are invoked in the Canon of the Mass and in the Litany of the Saints. Let the people show forth the wisdom of the saints, and the church declare their praise; and their names shall live unto generation and generation. (Ecclus. 44: 32, 1) Rejoice in the Lord, ye just: praise becometh the upright. v. Glory be to the Father and to the Son and to the Holy Ghost, as it was in the beginning, is now and ever shall be, world without end. Amen. Grant, we beseech Thee, O almighty God, that we who celebrate the feast day of Thy holy martyrs, Cosmas and Damian, by their intercession may be delivered from all dangers that threaten us. Through Jesus Christ, thy Son our Lord, Who liveth and reigneth with thee, in the unity of the Holy Ghost, ever one God, world without end. R. Amen. Lesson from the Book of Wisdom. But the just shall live foevermore, and their reward is with the Lord, and the care of them with the Most High. Therefore shall they receive a kingdom of glory, and a crown of beauty at the hand of the Lord: for with His right hand He will cover them, and with His holy arm He will defend them; and His zeal will take armor, and He will arm the creature for the revenge of His enemies. He will put on justice as a breastplate, and will take true judgment instead of a helmet; He will take equity for an invincible shield. The just cried, and the Lord heard them: and delivered them out of all their troubles. V. The Lord is nigh unto those who are troubled in heart, and the humble in spirit shall be saved. Alleluia, alleluia. V. This is the true brotherhood that overcometh the wickedness of the world; it hath followed Christ, holding fast to the glorious heavenly kingdom. Alleluia. May the loving prayers of Thy saints not be wanting to us, O Lord, to win us Thy gifts and ever to obtain us Thy pardon. Through Jesus Christ, thy Son our Lord, Who liveth and reigneth with thee, in the unity of the Holy Ghost, ever one God, world without end. May Thy people, we beseech Thee, O Lord, be protected by the privilege of participation in the heavenly banquet and by the prayer of the saints made in their behalf. Through Jesus Christ, thy Son our Lord, Who liveth and reigneth with thee, in the unity of the Holy Ghost, ever one God, world without end. R. Amen. Let the reception of this divine Sacrament protect us, O Lord, we beseech theee: and may thy servant Francis, whom thou has chosen as the chief pastor of thy Church, along with the flock committed to him derive always from it protection and help. Through Jesus Christ, thy Son our Lord, Who liveth and reigneth with thee, in the unity of the Holy Ghost, ever one God, world without end.